The DotAsia Organization and Pool.com are working together to bring the world yet another top-level domain: .asia. However, the concepts of “internet time” and “information age” seem to be alien to these people. Being in Asia, I applied for a bunch of .asia domains during the “landrush”, which ended March 12. Though many expect .asia to become a graveyard just like .eu, I’ve learned the hard way that it’s better to waste money buying domains you end up not using, than being unable to get the domains you want later. 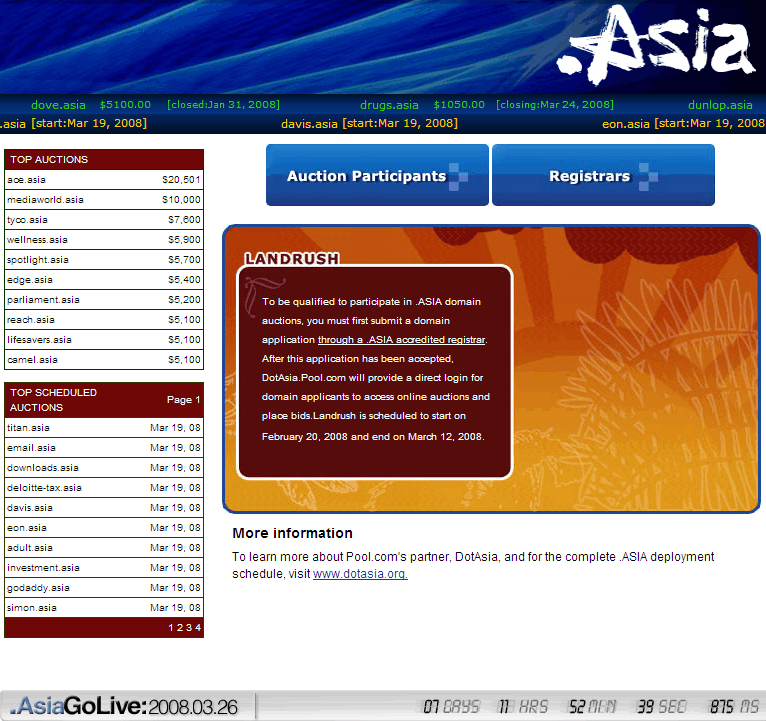 The .asia landrush is different than the one for all previous top-level domains. Instead of being first-come first-served, domains with multiple applications will go into auction. I don’t know when. Pool.com still tells me the landrush is scheduled to start one month ago, even though it ended one week ago. It would be nice if they’d update the page to say when I can expect the emails confirming my domain registration or entry to the auction process. I did find a link to a list of all domains with multiple applications on somebody else’s blog. So I already know that I’m the only applicant for all but on of the domains that I really want. Most of the domains I registered just for fun will go into auction. It is odd to see that of the 46,554 domains in that list, 16,866 domains or 36% are three-letter domains. Seems like more than one dude had the bright idea to try and squat on every three-letter combination. The longest domain with multiple registrations is themostperfectlycutdiamondsintheworld.asia. I wonder if this link will ever point to something meaningful. The .com version doesn’t when I write this. I’m sure that the .asia landrush and auction will all go as planned. I just need to be patient. But I would have expected more timely updates from an organization that talks like they’re going to put Asia on the Internet map. The first of my new blogs is now online: Regex Guru. I’ve never blogged about regular expressions on Shareware Beach. I deemed the topic too technical for this blog, and I already had a great website to post regex-related articles. But the web site didn’t have a news feed for updates. The new blog provides that. I’ll also use it for more technical behind-the-scenes information on RegexBuddy and PowerGREP. If you use regular expressions with any of my products, or with any other tool or programming language, Regex Guru is for you. You don’t need to be a regex guru yourself, but it helps if you’ve read my regular expression tutorial.